I have been extremely fortunate to have another one of my table runner designs to appear in Quiltmaker magazine! Simple Abundance is in the September/October 2010 Quiltmaker. It's made from a jelly roll or charm pack and it's super simple. I had nearly forgotten to blog about it when I realized that a fellow blogger Carol had already pieced the runner top! Friday, when I got home from a trip to Columbus I found a box from Colorado waiting for me. It was sent from Papercraft. I was totally confused. Turns out it was my Simple Abundance table runner finally coming back home to me. In addition to the runner, there was a PaperCraft magazine included. To my surprise, the table runner was pictured in this magazine too! Simple Abundance was made with Basic Grey's Origins fabric line. Basic Grey designs scrapbooking papers and other graphic art. It is only natural then to combine the 2! In my own investigating I realized that Quiltmaker has a kit available AND a kit for the framed piece that it featured with the runner. I might just have to get that in order to match my runner!!!! It's kind of cool that they incorporated paper love with fabric love. And for inquiring minds, this is the original runner made with Verna by Kate Spain for Moda. Congratulations, Vickie for your lovely project appearing in TWO magazines!! I can only imagine how thrilling that must be. Love the Kate Spain version, too. You are really adding to my to-do list these days!! Thanks again for another great idea! Vickie - congrats on having your projects published in both magazines! They are great projects w/ some fabulous fabrics! Very pretty! And it's so funny - my paper-crafting friend walked in the other day and saw a charm pack of Origins on my table, and said, "Oooh, that's Origins - I didn't know they made fabric!" I said, "Oh, do they make paper?" Kind of a case of the right hand not knowing what the left hand is doing! It would be really helpful in decorating to know that there are papers available in our quilting fabric designs - who knows what we might come up with! Well haven't you been a busy bee!! Vicki, congratulation - how nice for you! 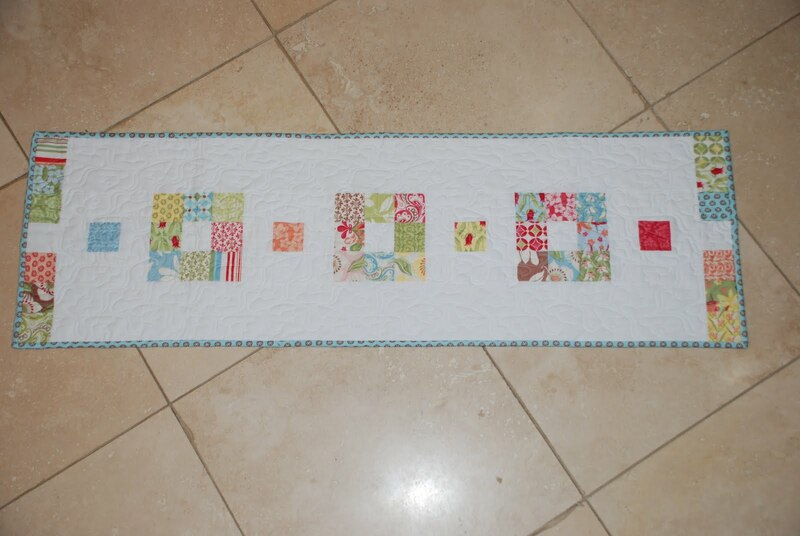 I would love to make the Simple Abundance table runner but can only find the kit. I have some charm packs I would like to use to make it but can't find the pattern. Do you have it for sale somewhere? Please advise, and congrats again! Congratulations! Added "Quiltmaker" to my Joann's list for this weekend! Now isn't that just the coolest? Congrats to you my friend! Love that tablerunner...I may have to see if I have enough Verna left to make that one. I heart Verna ALOT! Great table runner! I'll add that magazine to my Joann Etc. list for later this week. Congrats on getting into a magazine (again)! Congratulations to you! How exciting it must be! I'll have to try this one, it's very pretty! Vickie, That is fabulous!! You go girl!! Great runner and design and what an honor to be in both magazines. Great tablerunner. I'm going to have to go searching for that pattern. Congrats!!!! Congratulations! the color combination is so very good for the runners! Congratulations Vicki!! Love your table-runner. just wanted to say hello for Iowa. I was wondering if your yellow quilt was sent to an Iowa quilt shop that you talked about in an earlier post. Love the Kate Spain table topper. 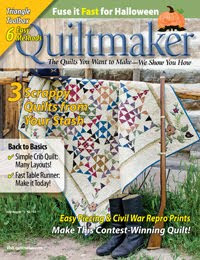 I am looking forward to seeing more of you in the pages of this favorite quilt mag! CONGRATS! What a cute runner. Simple and lovely - I love it!